For you musicians out there, doing your own recording sessions is not always easy. The gear to do so can get expensive. Now there is good news for you musicians. Creative has you covered. Their Creative SoundBlaster R3 YouTube Audio Recording Starter Kit was made just for you. Now recording your own sessions is both easy and fairly cheap. And if that wasn't enough, it's extremely portable too! The Creative SoundBlaster R3 came in a good looking colored box with photos of the product, and its specs. Opening the box revealed a nicely protected device. Materials used in the construction was mostly plastic. Yet the quality of materials was good. The fit and finish was also very good. It had a good feel to it in hand. And the controls had a good feel to them. Also included was the manual, USB cord, handheld mic, and small clip mic. I loved the fact that Creative included both a handheld mic and a small clip mic. Obviously you wouldn’t expect a full size XLR connector for the clip mic. But I was pleased to see a full sized XLR connector on the hand held mic. And the included XRL connect with metal connector and thick cable was better than expected. Creative is giving a high value for sure in their Sound Blaster R3. And whether you are singing with the handheld mic in hand, or you have an instrument like a guitar that you need to be able to mount the small clip mic to, Creative has you covered. So let’s see how it performs! For PC and Mac the connection is simple. Plug in the USB cable and install the program and you are ready to go. Although you can also capture it on a mobile device, such as a smartphone or tablet. The connections can also allow dual microphone input for your music. You can even hook up to speakers to play your music. So for your own studio monitoring, you can do so with either headphones or speakers. With Crystal Voice technology, it reduces noise and echos, which give you clear recording. This device is perfect for beginners and can be used for almost anything. The recordings can be played on your own MP3 player! Simple set-up, beautiful playback, and compatible with multiple formats, I loved the abilities of the SoundBlaster R3. These are the qualities you want! And the Sound Blaster R3 has it all. This Creative SoundBlaster R3 did great with audio recording and streaming onto my laptop. Vocals come thru loud and clear with no distortion or artifacts. I was impressed with the transparency, as the vocals had nice texture an harmonics, with better resolution than I expected. Using the small clip mic mounted on my violin, it performed the same. The sound was crisp and clean, with good dynamics, and very good resolution and texture from the strings and with no noticeable sound distortions, artifacts, or colorations. Aspiring musicians need to take notice. Now there is an extremely economical way to record and mix your musical creations. And the end result is good quality recordings. It's also an incredibly portable solution that you can take anywhere! 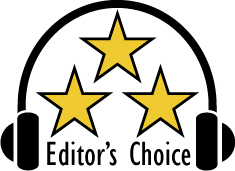 Based on its design, features, quality, and performance, the Creative SoundBlaster R3 has earned our Editor's Choice Award. For more info and complete specs, check out their website at www.us.creative.com.